I got snowshoes for Christmas two years ago and I love them. Last winter I only used them twice because we had hardly any snow, but this year I’ve already used them five times just in the past couple of weeks. I get a good workout going through the deep powder and there are plenty of places around Portland to go snowshoeing. I love running and I started getting into long-distance running when I was in college. I was a tri-athlete in high school and I had decided not to play soccer in college after much debate, so I needed a way to work out on my own. I picked up running although it was tough at first. In track, I was a sprinter and I hated doing even a mile warm-up at the beginning of practice. I slowly worked into it and started running 5K’s in the summer. In 2010 I decided to do a half-marathon even though a knee injury had kept me from the last 6 weeks of training. A week before the race, I decided to try and run 7 miles, about half of the race distance, and I ran it with no pain. I ended up finishing the half and was ready for more. I ran my first marathon a year later in Portland and did my second this past year. It’s an amazing way to stay in shape and I’ve never been in better shape in my life. I still look back on my training and think it’s crazy that I was able to go out and run 20 miles for training. I’m taking an extended break from marathons however and sticking to 5Ks and 10Ks, maybe a half once a year. Marathon training takes a lot of time and effort. I’m all for that and I guess I wouldn’t be thru-hiking if I wasn’t. But I enjoy doing 5Ks more so I’m heading back down to the 3.1 milers. After the 2012 Maine Marathon at the end of September, I was not going to make the same mistake as last year. I was going to stay in marathon shape and segue into my thru-hike from there. But, of course things had to go wrong. I went for a light one mile jog about a week after the race. I felt pretty good until right near the end, my right foot felt like it was cramping up. I wasn’t too worried at this point until it didn’t go away after hours, and days, and weeks. I started to worry. Would my foot feel better in time for our thru-hike? Did I need physical therapy or worse, surgery? I had to walk on the inside of my foot for weeks and iced it everyday and every night. After the race, my right calf felt super tight, most likely an indication of the injury in my foot. It was not like the first year where the elation of finishing the race kept me in higher spirits despite how painful my legs hurt. After doing research, my guess is that I either had peroneal tendinitis or a strained muscle on the outside of my foot due to poor running shoes and from running on slanted roads during the race. After my foot started to feel better, I headed to a local running store and got fitted for the most comfortable running shoes EVER: Brooks PureFlow. If you have really high arches then I would definitely recommend these shoes. They’re awesome. Shoes make a huge difference and so this has made me obsess more than ever about finding the perfect hiking shoe for our thru-hike. More on that in a later post. 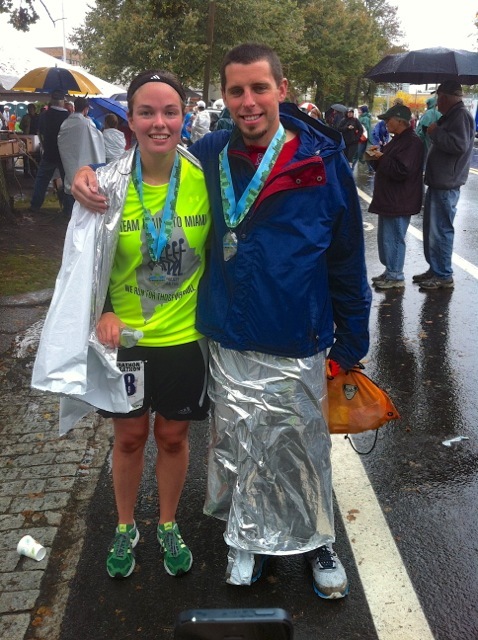 Miles and I after the Maine Marathon 2012. I finished my second marathon and Miles did his first half. So to make a long story short, I was out from running for a month after my race and when one day my foot magically felt better, I slowly got back into running. Because of the warmer fall weather we’ve had up here, I was able to do a few hikes in November and December while visiting my parents. I play on an indoor soccer team twice a week, and was able to play a lot of basketball while I was home for Christmas. I guess the important thing is that I’ve been active. Not as much as I’d like to be, but the single digit weekly countdown to our hike has made me think about going back to something more like my summer workout schedule. Work out 5 to 6 days a week with strength training 3 times a week and core exercises everyday. I realize that nothing will train me better for the hike than getting out there with my pack and hiking (and I may end up doing that a few times), but I think as long as I’m in good shape, that I maintain a strong core, and work on keeping up my strength in my back, arms, and legs, that I’ll be as ready as I can be. You might assume that the most difficult aspect of walking the length of the eastern United States would be purely physical. Undoubtedly thru-hiking the Appalachian Trail is a physical feat on par with few other challenges in life. You will push your body to new extremes. You will sweat. You will struggle. You will wake up and fall asleep sore. With that said, the physical challenge is not why seven in ten aspiring thru-hikers ultimately fall short of their goal. In no uncertain terms, the psychological and emotional struggle is what drives people off the Appalachian Trail. –Appalachian Trials. Zach Davis, 2012. So, for both Miles and I, our game plan is to stay in shape, eat well, and remember what we’re getting into and prepare for it as best we can: an all-encompassing journey that will test our emotional, physical, and psychological selves. Or maybe I’ll just sit on Miles and practice eating pints of Ben and Jerry’s while he does the 100 push-ups. I think I like that idea better. I came across your blog via meandering trail and acorn’s blogs. Good luck to you, I look forward to following your trek. You are already in great shape to start the hike. You are in such good shape you will have to be careful not to hike too fast as to get shin splints. You need to add icecream marathon regiments to put on a little hiking fat (you’ll need it). Thanks Chris! And yes, we will definitely be sure to keep the miles lower at the beginning so we don’t burn out early. We’ve got all summer to get to Maine! I look forward to following your thruhike from Kennebunk as I relive my 2012 thruhike through your journey. You’re going to have a blast.